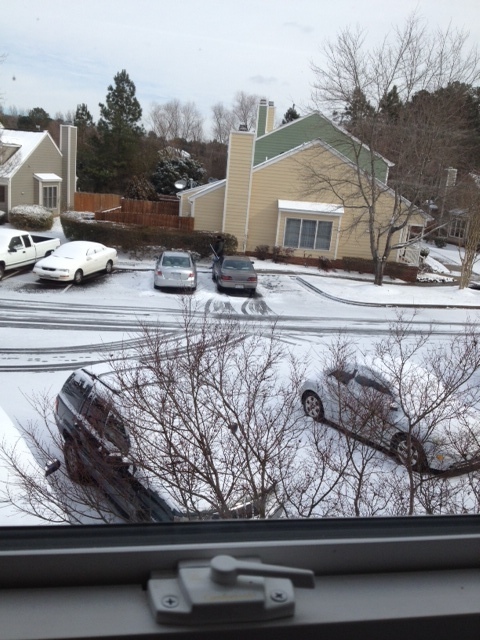 A view of my snow-covered Jeep from the upstairs office in our townhouse! So downstairs I clamored, anxious to please. And take pretty pictures! Snowed in, and only two ripe bananas left in the entire house (seriously, ya’ll, the bananas in this house disappear like hot cakes!). I needed to stretch those bananas! 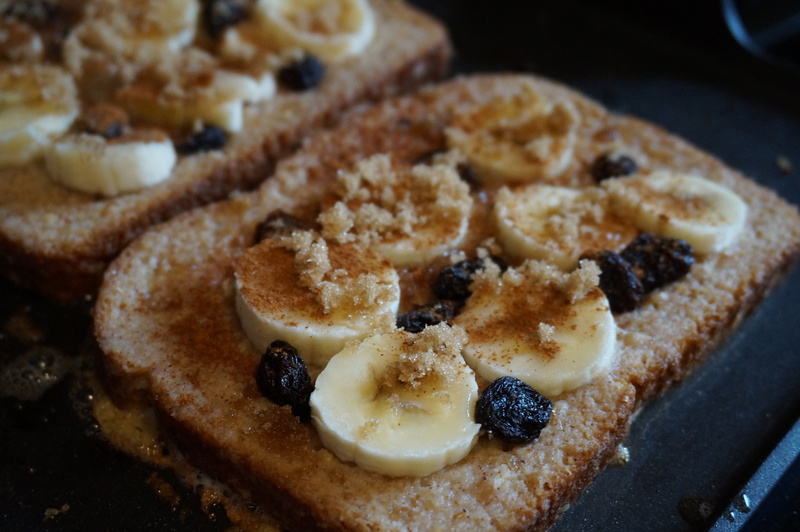 Instead of just topping the french toast with bananas after it’s cooked like I usually do, I decided to actually incorporate them into the recipe. But it didn’t seem like a good idea to put the bananas right in the batter, since I’d be dipping the bread and all the bananas would probably just slide off on the journey to the griddle. No one likes slidey-bananas. So instead, I decided to press the bananas and raisins right into one side of the toast while it was cooking, and while it was still “soggy” enough to be able to press right into the bread. I also decided to sprinkle a little more brown sugar and cinnamon on top, to (hopefully) result in a nice sticky caramelization when I flipped it! The result was (almost) just what I’d hoped for! It was a bit difficult to flip the bread, but not so much because of the bananas falling out- it was more due to the fact that the sandwich bread I used got so moist when dunked in the batter that it wanted to fall apart when I was flipping. In the future, I’ll try using a crustier loaf. The caramelized bananas, though, were magical. They formed this beautifully thick, sticky glaze over one side, so that it was almost like cooking syrup right into the french toast! Hope you enjoy your snow day, wherever you are! 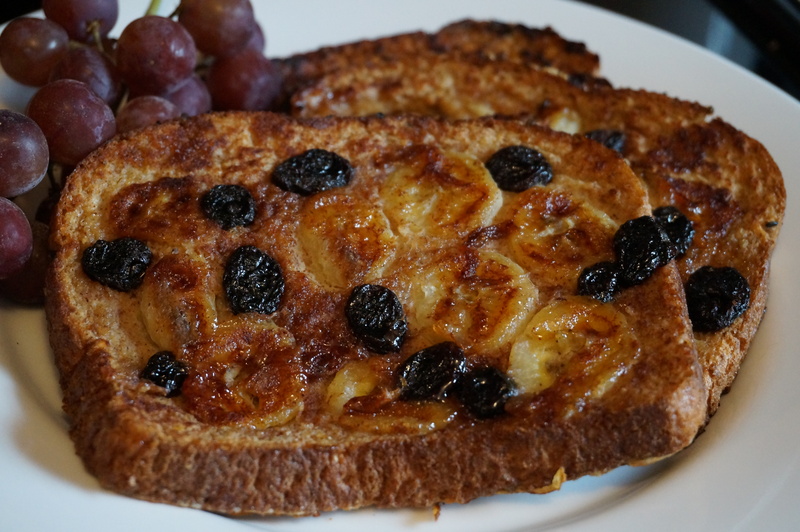 An easy and delicious spin on your traditional French Toast! 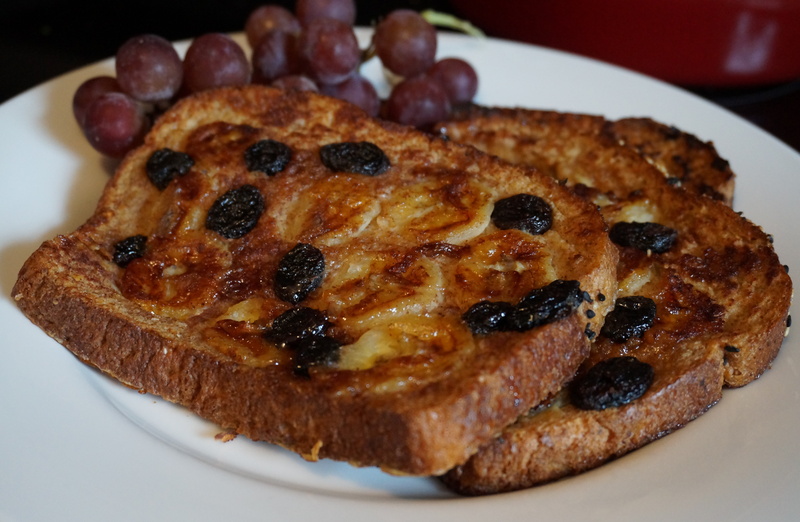 By pressing sliced bananas and raisins into the bread just after it’s been dipped, and sprinkling with a pinch of brown sugar, you get a beautifully caramelized topping that adds the perfect touch of elegance and fun to this Saturday morning (or snow day!) staple! In a medium bowl, whisk eggs, milk, sugars, and cinnamon. Heat griddle to medium. When hot, add a small pat of butter, making sure that it melts (but not burns!). Spread to coat pan. Douse two slices of bread in batter, coating both sides. Gently shake excess and lay both slices on griddle. 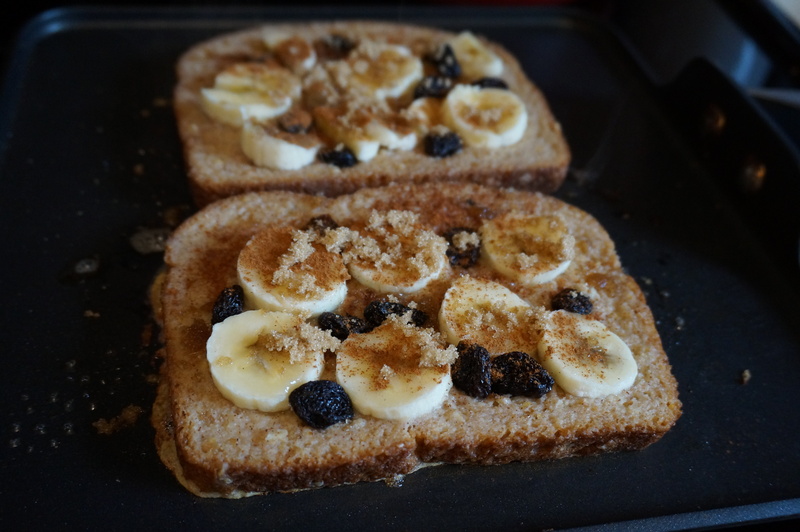 Gently press banana slices and raisins into the top of the bread. Sprinkle with additional brown sugar and cinnamon. Cook on medium heat for 2-3 minutes or until golden brown. Carefully flip bread and cook on the other side, 2 minutes. Flip again so that banana-raisin side is on top. The bananas should look nice and sticky! Remove from pan and place on plate. Keep warm in oven at 200 degrees while the remaining slices are cooking. Serve with a dollop of plain greek yogurt, a drizzle of honey, syrup, or (Ben’s favorite) peanut butter! When is it not a good morning for french toast? 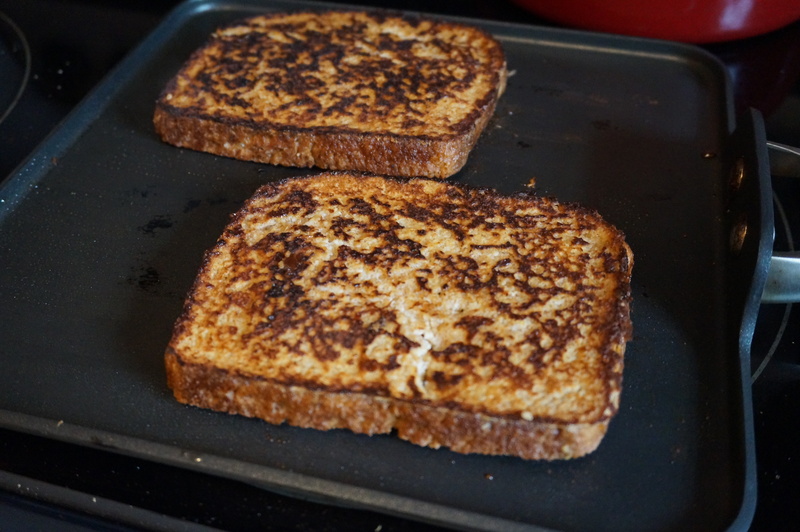 french toast is something i only have as an occasional treat, but this batch looks outstanding! definitely don’t need a snow day excuse to eat it!